Click on the user-menu (button with your name on it) to expand the menu. 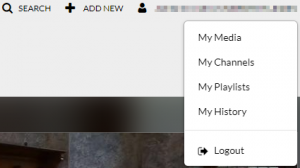 The ‘My Channels’ section is a overview of your channels. | NB: Please note the light-blue information-bar (‘You do not manage any channels’). Click on the ‘+ Create Channel’ button to create a new channel. The ‘Create a New Channel’ is being loaded. Similarly to the uploading of a video you can also enter additional information (metadata) here. For now you are only required to enter a channel name. (E.g. : ‘Voorbeeld Videokanaal’). Scroll to the bottom of the page and press ‘Save’. After you press save you will be redirected to the top of the page. If the creation of your channel was successful a green information-bar appears (‘The information was saved successfully’). Scroll to the bottom of the page and click ‘Back to Channel’.